On the evening of October 16th I changed out of my work clothes and headed up to the city to experience my very first ghost tour. Many of my friends have done these type of things here in Chicago and I know most major cities offer them during the Halloween season. The Windy City’s past is loaded with gangland violence from the days of Al Capone and Prohibition while also boasting one of the country’s first documented serial killers. Mild-mannered Dr. H. H. Holmes would lure visitors of Chicago’s World Columbian Exposition in 1893 to his hotel (later dubbed a “Murder Castle”) for the sole purpose of killing them. In the end he’d confess to twenty-seven slayings, though historians believe that number to be much closer to two hundred. 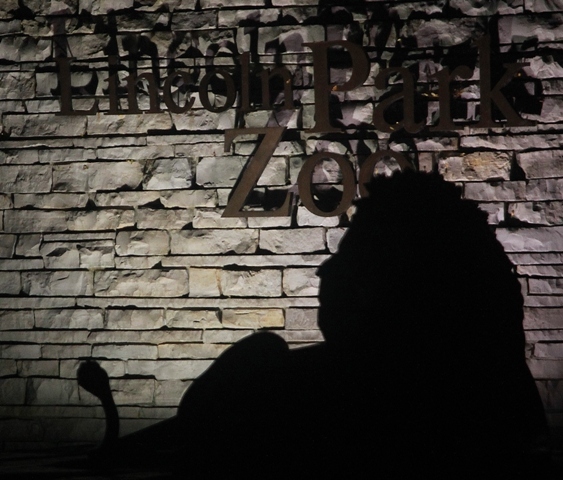 Such a violent past can not leave any metropolis without its fair share of myths and legends, and tonight I would learn that one of Chicago’s major attractions, The Lincoln Park Zoo, was resting on secrets of its own. In truth, it was really the zoo setting that attracted me to this tour in the first place. 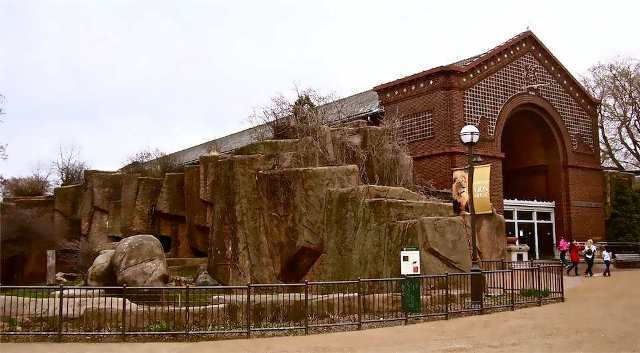 I strongly support AZA accredited zoos and their conservation initiatives and am a volunteer at Lincoln Park’s larger neighbor, Brookfield Zoo, located twelve miles southwest. Of course if you grew up in the Chicagoland area, you’d swear it was more like a hundred miles as city residents grew up faithful to Lincoln Park Zoo with us Suburbanites loyal to Brookfield. It wasn’t until the last few years when my love of animal photography and affiliation with AAZK (American Association of Zoo Keepers) would tear down that invisible barrier and I’d become a regular visitor and member of Lincoln Park. Needless to say, when I received a membership email offering a discounted ghost tour on zoo grounds, I jumped at the chance. 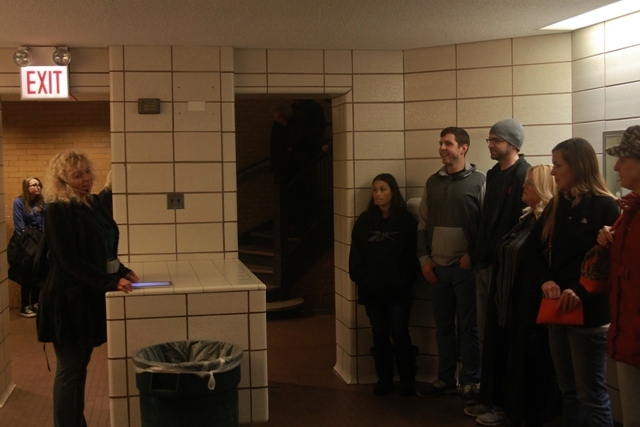 Another draw was having the tour led by Chicago’s local cemetery and ghost expert, Ursula Bielski. Bielski has penned ten books on the subject and I’d first met her at Horrorbles during a signing of her latest one, Graveyards of Chicago: The People, History, Art, and Lore of Cook County Cemeteries . I really love this book and it inspired us Daves to visit one of the featured locations, Showman’s Rest (which we discussed HERE), during a road trip last March. I’ve also bumped into her a few times at Svengoolie appearances as she’s a fellow fan of our local (now national TV) horror host. In fact I’d just run into her less than a week before at the Museum of Broadcast Communications for his 35th Anniversary. I was originally supposed to do this tour with a friend but they failed to purchase their ticket before this (and all other tours scheduled throughout the month) had sold out. Consequently, I entered the zoo alone that night before gathering with other guests in front of the tiger exhibit. It was a little awkward being the only one without a companion until I noticed a woman who was also by herself and decided to make conversation. Her name was Theresa and we instantly hit it off – grabbing our phones and becoming fast Facebook pals. Theresa’s attended previous ghostly events hosted by Bielski and, unlike me, has a lot of knowledge regarding paranormal investigation. I’m hopeful she’ll share some stories of those tours with me in the future and was appreciative of her companionship during this one. Soon Ursula appeared and the tour commenced. It started with a little history lesson of the grounds we were standing on….effectively a graveyard! 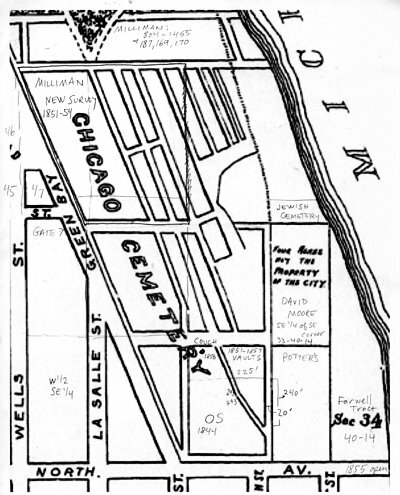 Long before this affluent area was called Lincoln Park it went under a very different moniker…the Chicago City Cemetery. Opening in the 1840’s, the cemetery would be one of the first and busiest in Chicago; said to have brought in 20,000 burials at its peak before having its final one in 1866. Why such a short run? Well, it seems that the cemetery’s reputation for shoddy burial practices along with its close proximity to Lake Michigan made it rather unpopular with the locals who equated an outbreak of cholera with the dead being so close to their water supply. It also made the grounds susceptible to flooding and the last thing anybody wanted to see after a heavy rain was a deceased relative floating down the street. The city kowtowed to public pressure and shut down the cemetery while ordering families to relocate the bodies. 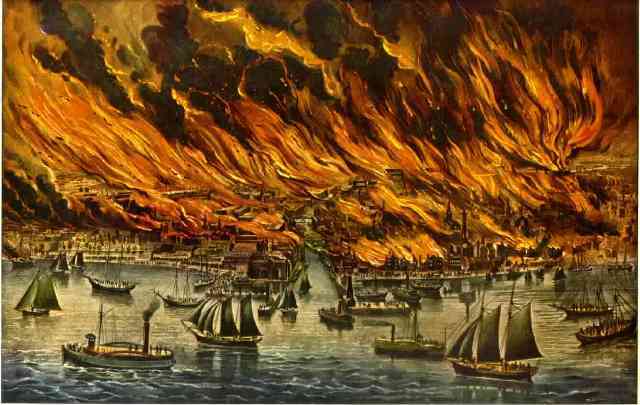 Unfortunately this is a long and arduous process and, before its completion, the Great Chicago Fire broke out in 1871. The historic blaze would rage for three days, burning over three square miles of the city; including what was left of the Chicago City Cemetery. Considering the fact that many of the grave markers were wooden (i.e. flammable), it made retrieving the remaining occupants nothing short of impossible. It was long believed that about a thousand bodies still rested in the area until local historian, Professor Pamela Bannos from Northwestern University, challenged the theory. 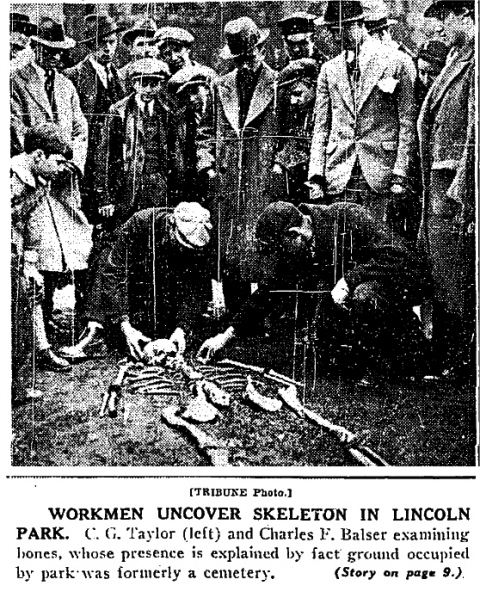 Professor Bannos was kind enough to confirm with me what her painstaking research (mapped out via her incredible website, Hidden Truths: The Chicago City Cemetery & Lincoln Park) had already revealed…that the number of bodies still lying under Lincoln Park is likely between ten and twelve thousand! In fact it’s nearly impossible for any construction work in the area not to uncover remains. In 1998, eighty one bodies were unearthed during a nearby parking lot project which included the discovery of one resting inside a Fisk Iron Burial Casket. These body-shaped coffins were produced in Providence, Rhode Island during the mid 1800’s and reserved for the wealthy. They were hermetically sealed which prevented decomposition and many offered a window where you could see the occupant’s face. People in the 1800’s must have been fearless because just looking at one of those caskets would have me screaming for the hills ala Lou Costello! Incidentally, the full story of this discovery along with audio interviews can be found on Professor Bannos’ site which you can link to HERE. In 1962, Lincoln Park Zoo Director (and local legend whom I remember watching on The Ray Rayner Show when I was a kid), Dr. Lester Fisher, was left in a quandary when a body was found during the construction of the zoo’s new barn, the cornerstone of a farm being built adjacent to the park. After contacting the city and encountering a sufficient amount of red-tape (which I understand is customary when an old body is found in this area) he made the executive decision to have it returned to the ground it came from and have the barn built right over it. Not surprisingly, locals began reporting ghosts as early as the late 1800’s. What is a surprise, however, is that they never equated the hauntings to the former cemetery. Rather it was widely believed that the restless spirits were victims of a High Bridge that once stood nearby. Bielski took us back out of the zoo’s main entrance and over to a lagoon across from the parking lot which, during the summer, is a favored spot for joggers and picnickers. 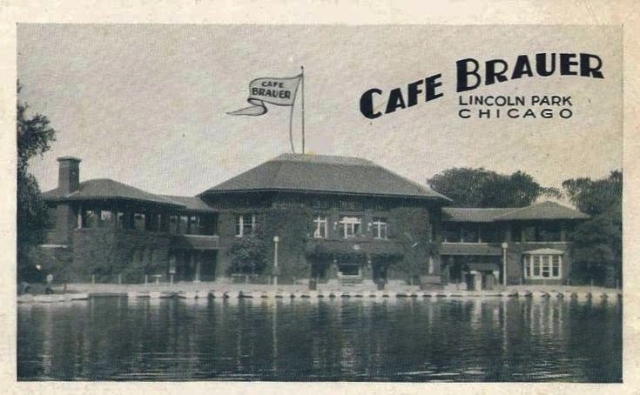 After the cemetery closed down, Lincoln Park was built up as a recreational haven and remains so today. One hundred years ago, it was also the site of a forty-two foot tall bridge designed for visitors to gaze out and enjoy the areas beauty. Unfortunately, the bridge wasn’t just appealing to sightseers but also those looking to end their lives. Mysterious Chicago lists the number of people who successfully killed themselves (either by jumping off the bridge, hanging themselves from it…or just picking the spot to shoot or stab themselves) as somewhere between fifty and a hundred. 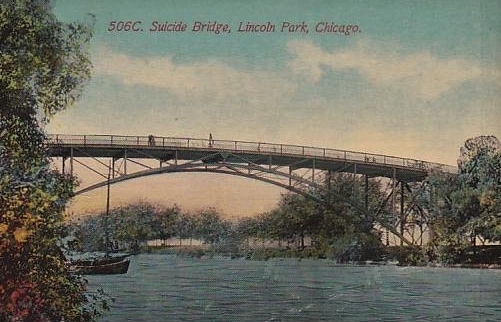 Though it only stood from 1894 – 1919 it firmly established itself as Chicago’s “Suicide Bridge” and was even identified as such on city postcards. 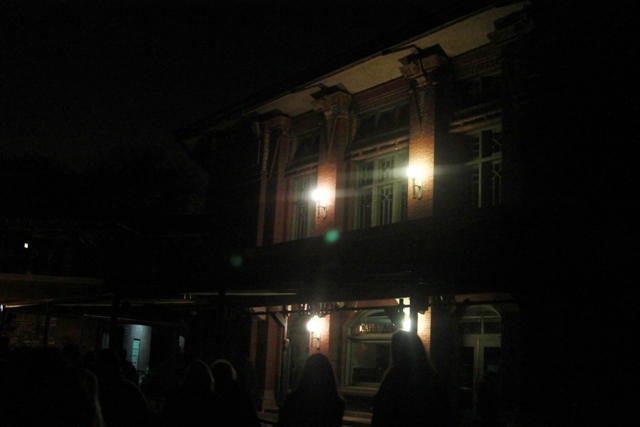 Prior to the tours, Bielski set out with her team of ghost hunters to investigate the area. I should mention that I have never seen nor heard a ghost in my life though I do know some very credible folks who claim they have. I’ve also never watched any of the numerous ghost-hunting TV shows that are out there and am unfamiliar with the tools one uses to measure such things. I had, however, heard of EVP (Electronic Voice Phenomena). We walked back into the zoo and made our way into the entrance of The Lion House. According to Bielski, this exhibit emitted the strongest ghostly impulses – particularly the basement ladies room. She contends that long before she was tapped to do this tour she’d received many calls from zoo patrons claiming they’d experienced something at this location (often claiming to see people in Victorian era clothing). According to Bielski, this made sense as we were actually standing inside an old grave. Most of the reported sightings were said to be while looking in one of the bathroom’s numerous mirrors. 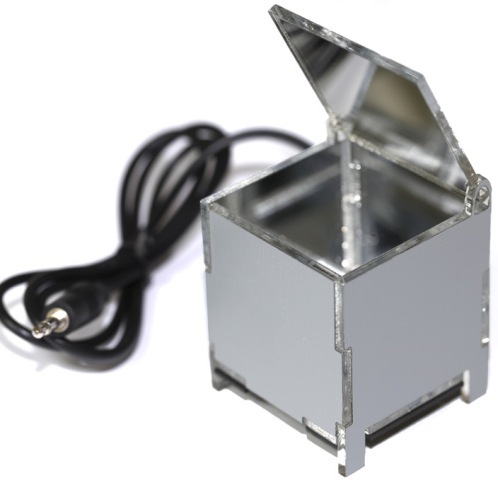 Bielski explained that mirrors are often used with great effect by ghost hunters, particularly when utilized in a “devil’s toy box.” This device is a cube in which all six of the inside walls (equal in size) are mirrors. The theory is that it creates an energy loop that attracts spirits and then traps them, making it ideal for recording EVP. Bielski didn’t claim to have used one here but did suggest that the site’s supernatural activity may have been due to the same principle. We walked back outside and made our way to the steps of the Primate Building. 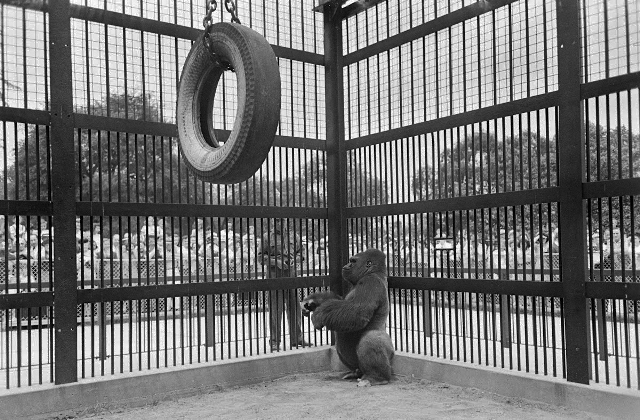 Bielski discussed one of the zoo’s most famous residents, a Western Lowland gorilla named “Bushman.” Bushman was one of Chicago’s most popular animals (it is said that some fifteen thousand people came to the zoo on a single day to pay their respects to him after he’d taken ill) and lived at Lincoln Park from 1930 until his death in 1951. He is now a permanent resident of The Field Museum of Natural History. I was hoping she was going to pop out her tablet and reveal the grunts of a ghostly Silverback but no such luck. Of course the biggest question on everyone’s mind was whether or not any of the park’s former residents were haunting the zoo. Other than an EVP recording of what sounded like a lion’s roar, however, there was no evidence suggesting this to be the case. The results of Bielski’s investigation clearly illustrated that any ghosts haunting the Lincoln Park Zoo had walked on two legs during their former lives. Bielski’s ghost hunting team managed to record EVP in this building as well; initially hoping to capture the voice of Dr. Lester Fisher. Of course the best way to hear his voice would be to pick up the phone and call him (Dr. Fisher is still very much alive at the date of this posting) but Bielski explained that, so far as EVP is concerned, there’s a difference between “energy” and “entity.” She contends that all of us are made up of energy and can leave trace amounts of it at certain locations whether alive or dead. In contrast, EVP coming from an “entity” would be emanating from an unidentified, supernatural force (i.e. a ghost). Though they had no luck finding the voice of Dr. Fisher, they did manage to catch other voices, such as one with an Australian accent saying, “Who cares?” when Bielski stated she was there to study and learn more about them. After leaving the Primate Building, we walked through the zoo, past the restaurant, before heading to an area near The Regenstein Small Mammal/Reptile House. Bielski asked if anyone remembered the old Viking Ship that used to sit at this location. I moved closer to make sure I’d heard her correctly (remember, I grew up going to the Brookfield Zoo). 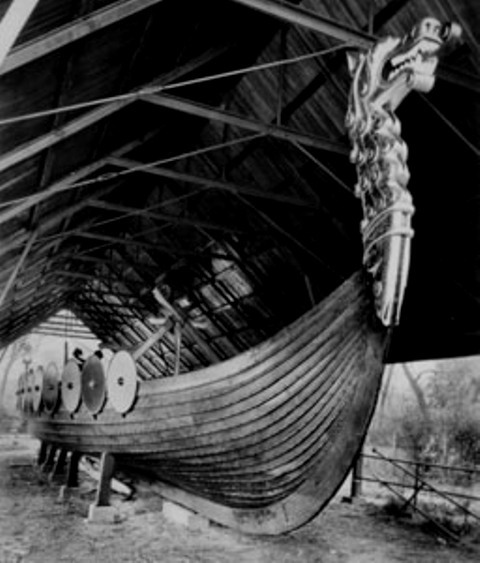 Apparently a 78 foot long replica of an ancient Viking ship actually sailed across the ocean to Chicago for that aforementioned Columbian Exposition. After being dry-docked outside The Field Museum, it was eventually restored in 1920 and put on display at The Lincoln Park Zoo which, unless you’re using it to decorate a polar bear exhibit, seems a rather strange place for it to be. Regardless, it spent almost seventy-five years at the zoo until finally finding a home in Geneva, Illinois at Good Templar Park. The next stop on our tour was the zoo’s Café Brauer which is a favored spot for wedding receptions and posh gatherings. It was particularly beautiful on this October night with the lights of the city’s skyscrapers reflecting off the water and I could totally understand why Chicago’s elite would choose this venue to celebrate their special occasions. Bielski quickly shattered my warm, fuzzy feelings but mentioning it was also a popular spot for dumping bodies back in the ’20s. In fact, her team picked up so many voices and negative energy that both her and one of her associates claimed to have felt physically ill while doing walk-throughs. I’m thinking this is probably something the zoo will want to leave off the brochure. We walked outside the back gate and out to the farm area I mentioned earlier. The soft glow of the street lights seemed to enhance the supernatural elements of this occasion. I was fascinated by this tour and learning of the area’s local history. I took some time afterwards to thank Ms Bielski on what had been a truly amazing experience. In doing so, however, I’d inadvertently taken myself to a truly terrifying moment and the first time I’ve been genuinely scared in a long, long time. After saying goodbye to my new friend, Theresa, I walked back to the zoo gate only to discover that it had been locked shut. This meant I had no choice but to return to my car at the opposite end by going around the zoo. 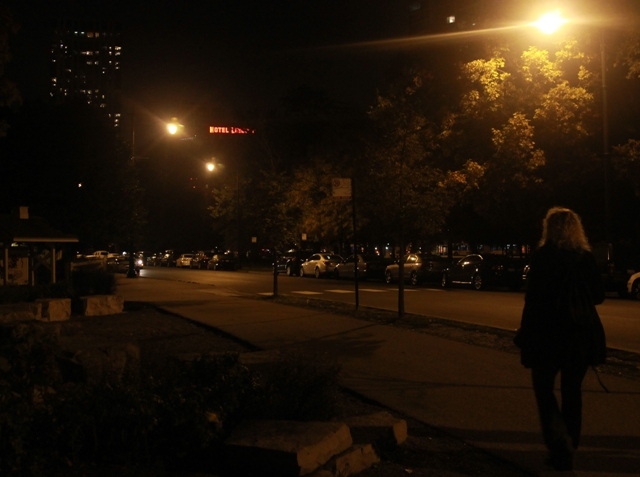 I treaded on a concrete walkway that was fairly dark due to surrounding trees; alone in the middle of the night and in a part of Chicago I now knew was home to over ten thousand bodies. At that point I was just as frightened of the living as I was of the dead. I kept a brisk pace with my head down before suddenly hearing the unmistakable sounds of horse hooves clip-clopping in the distance. As the sounds grew closer, I broke out into a cold sweat with my heart racing. Good Lord! How did Ursula manage to leave out Lincoln Park having its own Headless Horseman??? With a hip hip and a clippity-clop. He’s out looking for a top to chop. So don’t try to figure out a plan. The horse was now within twenty feet and my body was now in full “fight or flight” mode (actually, who am kidding, it was definitely “flight” if only my knees would stop buckling and I could do so) with my Svengoolie glow-in-the-dark T-shirt now drenched in sweat. I thought about texting my friends a “Goodbye” message but my hands were shaking so hard there was no way I could type. Soon the horse was upon me and, conceding my end, I mustered what little courage I had left and turned to face my assailant. I was then blinded by a flashlight before my eyes adjusted to the sight of a Chicago policeman on horseback. “Did you need help finding your car?” he asked. This entry was posted in Supernatural and tagged Bushman, Chicago City Cemetery, Dr. Lester Fisher, Electronic Voice Phenomena, Fisk Iron Casket, Ghost Tour, Lincoln Park Zoo, The Suicide Bridge, Ursula Bielski. Bookmark the permalink. ← Jack O’ Lantern Spectacular Part 5!